There was a lot of hovering when I was making these. Hovering by my brothers lured by the smell of something frying. Hovering by the FH, trying to grab them before I photographed them. And hovering by the dog as I passed them out to everyone. 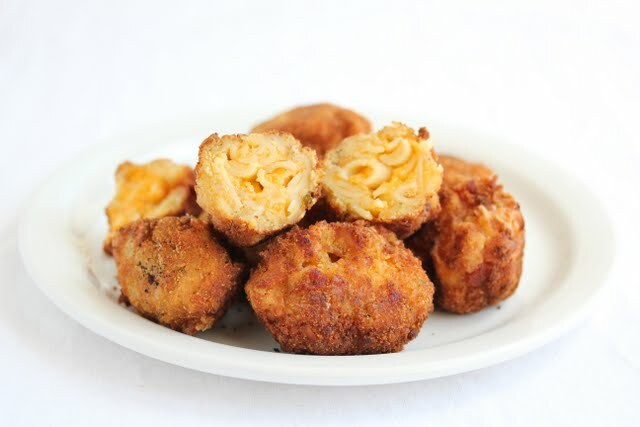 Fried Macaroni and Cheese Balls have been on my brain lately. 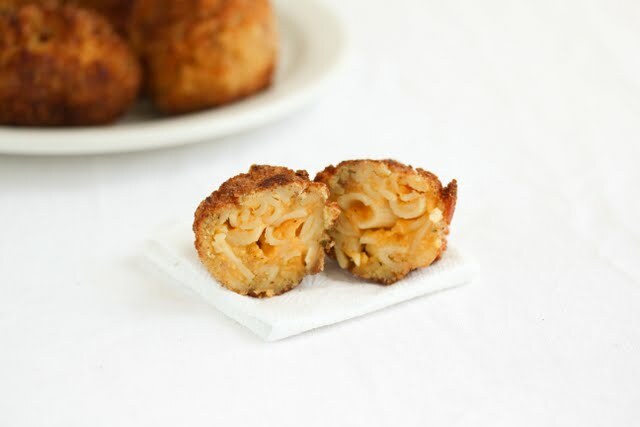 I had some delicious mac n cheese balls about a year ago at Bonnie Jean’s, a restaurant specializing in soul food. Then my brother recently visited, making me remember those delicious cheese balls again. I had a block of cheddar cheese I needed to use up, so it was perfect. 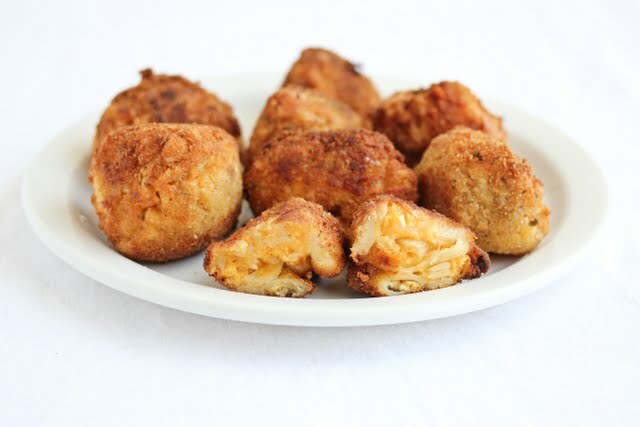 I made a huge batch of macaroni and cheese and used some of it to make these mac and cheese balls. I don’t make macaroni and cheese often, so I don’t have a “go to” recipe. I used a recipe for stove top macaroni and cheese by Alton Brown. My macaroni and cheese didn’t turn out as creamy as I would have liked, but I think that made it a little easier to fry up the balls. The ones I tried at the restaurant contained some jalapeno peppers for a spicy kick. I didn’t have any peppers to add to my macaroni. But I did have some bacon, which added a nice salty flavor to keep the cheese from getting too plain. I crumbled up some bacon and added it to the macaroni and also added some to the outside breadcrumb coating. These were gone quicker than it took to make them. No coaxing anyone to eat these. I’ll definitely be making them again. I might try it next time with a different macaroni and cheese recipe, but Alton Brown’s macaroni recipe is a good one to use. These mac and cheese balls are inspired by ones I had at soul food restaurant called Bonnie Jean's. My version starts with Alton Brown's stovetop mac-n-cheese (the recipe is linked below) - an easy recipe for creamy mac and cheese. These are a fun project and everyone in my house loves them! Stir the bacon into the prepared mac and cheese. Scoop enough mac and cheese to form a ball the size of a golf ball and wrap it in a piece of plastic wrap. Use the plastic to firmly squeeze the mac and cheese together to form a tight ball. Unwrap the ball and set it on a clean plate and repeat this process with the rest of the mac and cheese until all the balls are formed. Place the flour, eggs, and breadcrumbs in separate bowls. Coat each ball with the flour, followed by the egg mixture. Then coat it with the breadcrumb mixture. Repeat again, first with flour, then egg and then breadcrumb mixture again. After each dredge, the ball may begin to loosen. Gently squeeze and tighten the ball before dredging in the next bowl. 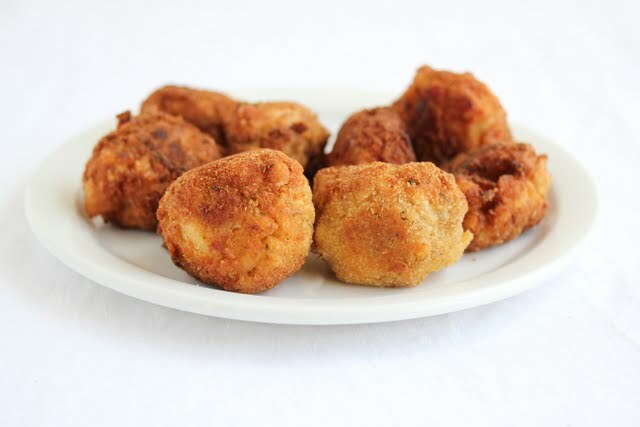 Fill a frying pan with enough oil to fry the balls and heat it over medium heat. Once the oil is hot, place the ball into the hot oil. You should need about 30 seconds to 1 minute for each side. Flip the ball so all sides cook evenly to a light brown. Transfer the ball to a clean plate and repeat with the remaining balls. I used Alton Brown's mac-n-cheese recipe because it's simple to make on the stovetop. You can use your favorite recipe just be sure that it's a creamy one and serves six to eight people. The nutrition estimates include the information for the mac and cheese recipe I used. Depending on the recipe you use the estimates may vary. I had this as an appetizer in a restaurant about two weeks ago. Oh, my gosh they were good!! oh my goodness, this sounds like a heart attack waiting to happen. Translation. 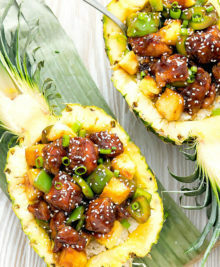 Making this, this weekend!! :p thanks for the recipe!! oh my.. these look amazing!! I just made these. I used kraft mac and cheese out of the box and it was still delicious. I did add my own cajun spices. Dip them in ranch mixed with hot sauce!!! How many balls does it make? Just a suggestion….you mentioned that at times you had to squeeze to reshape the ball before coating. What I have done is put the Saran-wrapped balls into the refrigerator for about 30 minutes….they hold together so much better! Great recipe though!! !